What to know: Wonderfully charming tale, exquisitely told. This is a wonderfully charming tale, exquisitely told. Kudos to director Michael W. Driesch and his team of talented actors to bring such a great story to the screen. It is well filmed with great visuals throughout, excellent audio & background music and wonderful cast. The dialogue is in German with English sub-titles but easily read. I highly recommend this for the KIDS FIRST! 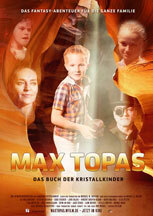 Film Festivals for ages 8 to 15 and give it 5 out of 6 stars. Reviewed by Julie S., KIDS FIRST! Juror. Nine-year-old Max Topas wakes up much too late one morning and finds that his parents and sister have vanished without a trace. Monsieur Quidam, a peculiar stranger, appears just at that moment, claiming to have cast a spell on the family, that they were about to embark on a trip around the world from which they would never return and that they would have no memory of Max at all. There was only one way to stop all this: within just two hours, Max must find the 'Book of the Crystal Children' for Monsieur Quidam. The only clue provided by the mysterious Quidam is the business card of Madame Edda, a lady who would help Max make sense of all this and be able to point him towards finding the book. From Madame Edda, Max learns that he is a so-called 'Crystal Child' with the ability to enter a special 'Dreamland'. And so begins a spectacular search for the book that will take Max, during the course of a couple of hours, into the dream world and around the world.